Recorded Saturday, May 2, 2015, at the NYC New York Society for Ethical Culture. Hosted by Clifton Truman Daniel, grandson of US President Harry S. Truman with animations by Amber Cooper-Davies. Written and produced by Kathleen Sullivan & Robert Croonquist. An Ethical Event produced by Youth Arts New York/Hibakusha Stories in collaboration with Peace Boat US. 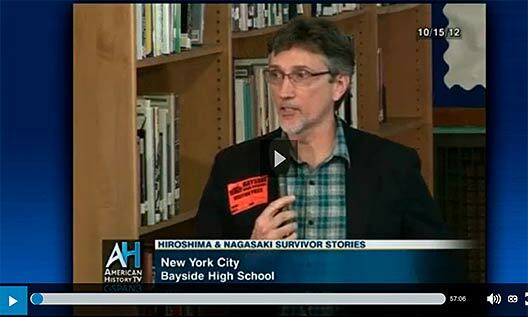 On May 2, 2013, The Japan Society & Hibakusha Stories presented “Atomic Bomb Survivors Meet Descendants of Harry Truman and the Manhattan Project” with students in New York City Public High Schools. The evening featured Clifton Truman Daniel, Shigeko Sasamori, Jong-keun Lee, and Dr. Cynthia Miller. Marie Cochranen graciously acted as interpreter. Robert Fish of the Japan Society & Robert Croonquist of Hibakusha Stories provided opening remarks. In May of 2012 the intrepid Hibakusha Stories team visited many New York City area high schools to make presentations to the attentive school kids. These recordings document the visits to East Community High School, Bayside High School, Lower Manhattan Arts Academy High School, and Harlem Renaissance High School. Actor and UN Messenger of Peace Michael Douglas (left) speaks during a special event at UN headquarters to launch a book, co-authored by Hibakusha Stories Program Director, Kathleen Sullivan.